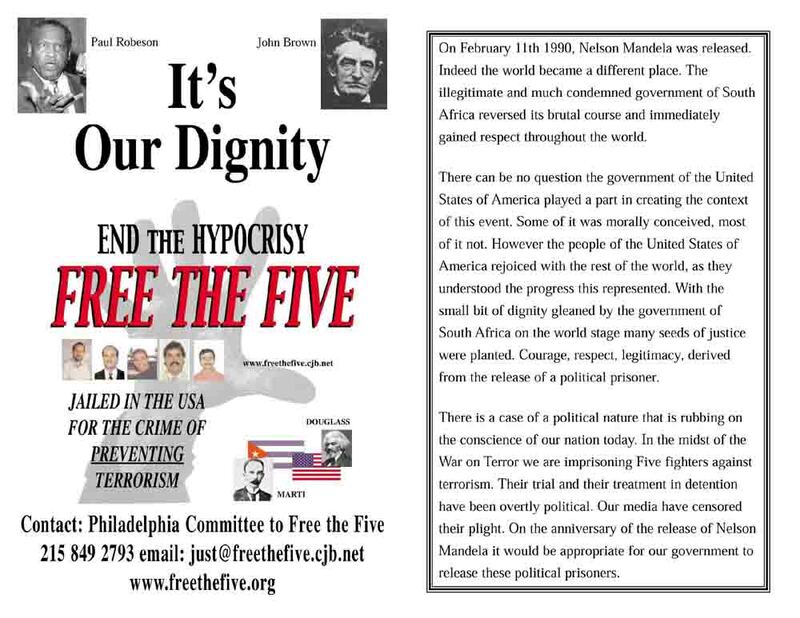 Download these materials to use in the campaign to Free the Five and Defend our Culture! The film documentary "Mission Against Terror" made its premiere in Philadelphia to an enthusiastic and engaged crowd at three venues, the White Dog Café in West Philadelphia, at the Women's Y in Germantown and the Taller Puertorriqueño in North Philadelphia. 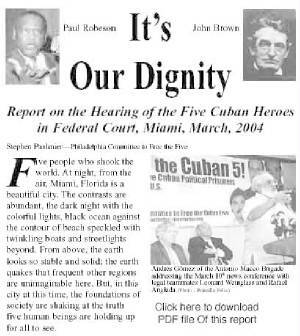 Enticed by the advanced heralding of a Irish/Cuban perspective on what US media portrays as a "with us or against us" myopic view of a "war on terror", viewers thronged to the events. Hungry for a different point of view, no one was disappointed. From the opening titles to the closing credits, the audience witnessed the articulation of our human condition as it relates to qualities of dignity, courage, justice and commitment. The film is an exposé of the hypocritical stance on security by the United States government and its surrogates. The US pontificates about a "war on terror" while humiliating its own people by brutalizing five courageous men whose only crime was to effectively prevent wanton attacks upon innocents. On a background of decades of overt and covert aggression waged by successive US administrations, the film articulates the actions of five men who infiltrate and report on some of the fanatical terrorist groups based in South Florida. Detailed video clips of experts from several countries show that these attacks were planned, equipped and financed by the government of the United States. It describes how, at the urging of the Cuban authorities, agents of the FBI came to Cuba to collect the plethora of evidence gathered on the venal activities of these groups. Subsequently the five men who had helped collect the evidence are arrested, detained, tried and imprisoned for their efforts. Woven into the narrative is the story of the families of the five and their struggle to claim the right to even visit their loved ones. The film is a mosaic of unusual depth and eloquence, detailing the crux of the dilemma that the "war on terror" has created. Visioning through example, the film relates the experience of a true to life mission against terror. The directors hold their audience in a dignified way, expecting the high level of experience and wisdom alive in our communities. This is cinema to empower. In Philadelphia the film was so well received that promoters are planning for additional local screenings in the near future. The added draw to this premiere was the presence of one of the films co-directors, Bernie Dwyer. The other co-director, Roberto Ruiz, was prevented from participating in the tour due to the illegally imposed US blockade on Cuba. 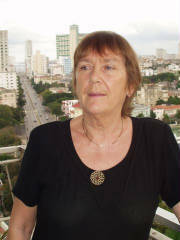 Bernie Dwyer, an Irish national, lent her clear and experienced voice to the questions and comments of the gathered multitude. Everyone wanted to know, "What can we do to correct this shameful conduct by our 'justice' system?" 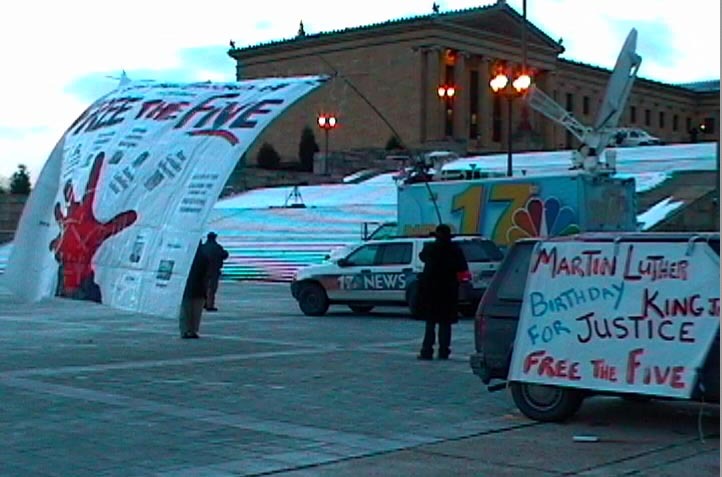 At every venue the answer came, join the dynamic movement already in motion to Free the Five. 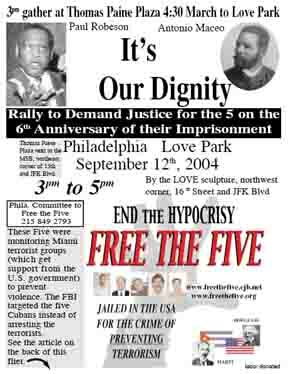 The National Committee to Free the Five and the Philadelphia Committee to Free the Five are engaged in an effort to compel the authorities to reverse this injustice. To respect the legal and ethical codes that require them to allow all the wives and children of the Five to visit their loved ones. This tactic, it was explained, besides being a righteous act, would also serve to heighten the profile of the issue which has been criminally ignored by the United States mass media and politicians at all levels. With the appeal process now stalled, the 11th Circuit Court of Appeals is in its tenth month of waiting to hand down a decision, all possible efforts should be expended to provide a context within which the Justices can make their ruling. 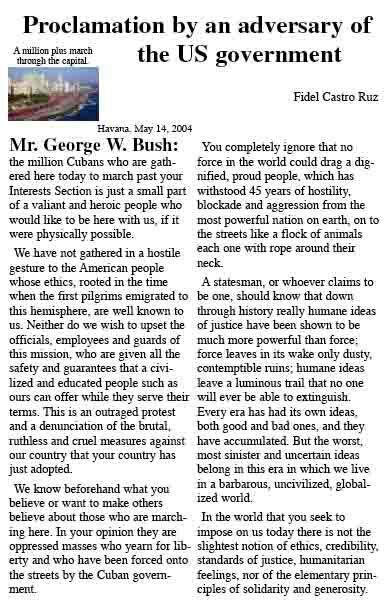 As the film points out, the Elian Gonzales debacle (a contemporary event with the trial of the Five) was brought to justice only through a similar invocation by the justice loving people of the United States. 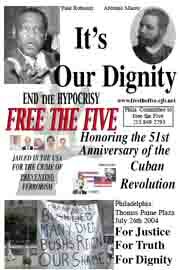 One of the most poignant moments of the three event hosting of this cinematic masterpiece was the screening of the film at Taller Puertorriqueño, the Puerto Rican community center in North Philadelphia. 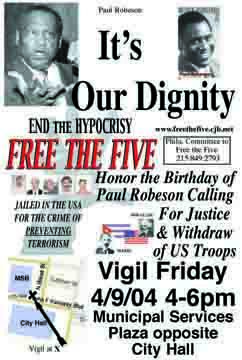 Fresh from a tremendous victory in ejecting the US military from the island of Vieques and the liberation of several of the Political Prisoners held for their just avocation for the independence of Puerto Rico, this community gladly screened the film on short notice. 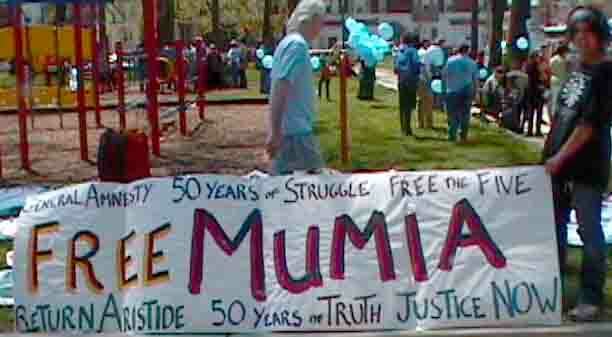 At the Germantown screening the audience assiduously maintained the vital connection that this subject has to the struggle for justice being waged for the freedom of Mumia Abu Jamal. That this documentary has important value as a tool in the people's political arsenal was clear throughout. Don't miss an opportunity to see this empowering and inspiring work of art. "Angolan Leader Honors Cuban Fighters Killed in Africa" was the headline. For those of us who know the history of the struggle for justice in the south of the African continent, the country of Angola is pivotal. For many of us the shame at how the United States supplied and trained the South African racist military monster in terrorizing the whole area is ever present. What we would have done as a nation to nurture and support the independence struggles emerging there. Struggles close to our hearts reminding us of our own efforts to throw off the yoke of oppression that sought to crushed our humanity with slavery, lynching and Jim Crow. How many of us would have gladly given our bodies and souls to fight shoulder to shoulder with the Angolans against the Apartheid hordes? But US State department "diplomacy" ruled the righteous (the Angolan people and their allies) to be sinners and the devil himself (the Apartheid regime) to be blessed. The heroic mettle of the American people, Black Brown and white was not to be tested on that stage. We were sold out. We were betrayed, lied to and suppressed. Humiliated into watching as the wealth of our sweat was used to empower the torturer of our sisters and brothers in Africa. Not so for the citizens of Cuba. The African people of Angola signaled the world with the drumbeat of truth and a will to be free. 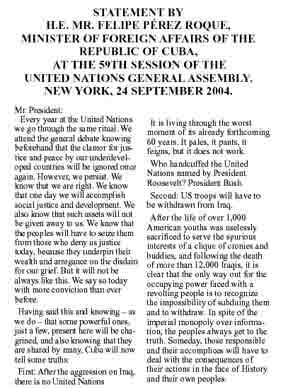 From the bosom of Cuba came the response, we are with you. 300,000 Cubans volunteered, travelling across the Atlantic to serve with honor in the cause of justice and international solidarity. They fought bravely and cunningly. They defeated the most highly trained and equipped troops the South Africans could muster. Together the Angolans and Cubans changed the course of the history on that continent. They inflicted such a blow that the very core of that system, Apartheid South Africa, was mortally wounded. Our country should have given its citizenry the opportunity to assist on the side of justice in that fight. It did not. And now several of those Cubans who did serve in Angola are imprisoned in our jails. Empower yourself to oppose their political imprisonment. Learn about this case through this film and expose this wrong. In doing so we reclaim the dignity denied to us by the actions of a powerful few. 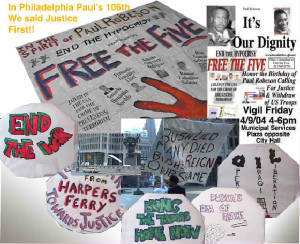 About 30 friends Rallied in Philadelphia to Demand Justice for the Five on the 6th Anniversary of their Imprisonment They gathered at Thomas Paine Plaza next to Love Park. Our banner appears above. Stay tuned there is more to come. 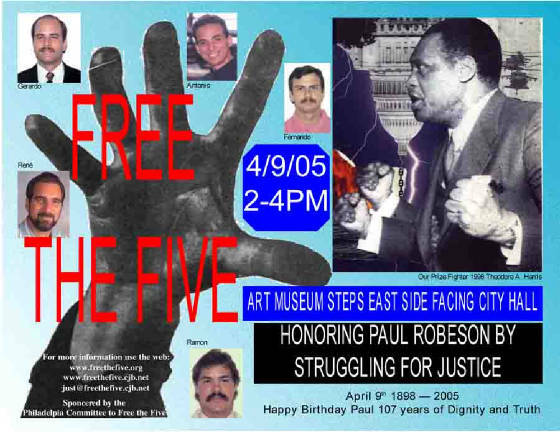 Free the Five in 2005! A crime assaulting the dignity and honor of every working class person, which shames our history, is an affront to our culture and an insult to our legal principles requires a Peoples Tribunal. The particulars of this crime are hidden from public view with the complicity of the mass media and the oligarchy making this investigation a necessary tool for exposing the truth. The justice woven into our righteous struggle will free these five and propel us to greater heights of unity and empowerment as a class capable of revolutionary progress and deed. The case to be made will focus on dispelling the fog of lies and myths that are heaped upon our people by the ones who profit from our oppression. We will use this outrageous assault on just societal relations and comradely international fraternity to expose again the ugly head of the beast that so brutally denies our cultural and historical identity and the proceeds of our labor.